Primeval Pine Grove Park, Little Falls, MN, undated photo from MCHS collections. On August 31, 2011, the Dewey-Radke House in Pine Grove Park was demolished by the City of Little Falls, Minnesota. The house had been part of the west side of the city since 1893 and its demolition stirred a passionate debate about the role of preservation and history in the community. Concerned individuals and organizations from across the state and nation have voiced their opinions and even their outrage at the turn of events. The occasionally heated rhetoric is a clear reminder that history is far from uncontroversial and should never be taken for granted. In our increasingly fast-paced and disposable world, historic sites, structures and landscapes can disappear with alarming speed. While saving everything is not realistic or even necessarily desired, having meaningful discussions and giving careful thought as to what can and should be saved is critical. The issues raised on all sides of the Dewey-Radke debate have consistently left me with one nagging question…what about the park? What about the historic landscape that seems to have been left out of much of the discussion? What about that magnificent grove of virgin white pine preserved over a century ago by passionate and devoted citizens? What about Pine Grove Park? …none of the growing pine on said land shall be ever cut or removed except when necessary for the health of the other pine of the grove. And all the land shall be used, cared for and protected for park purposes. And in case of failure to so use, protect and care for the same. Or in case said land is used for any other than park purposes, then it shall revert to and become the property of the Grantors herein their heirs and assigns, in fee, and in the proportions of their respective interests therein at the date of this deed”. Pine Grove Park was established at a time when there was growing excitement for parks nationwide. The rise of a national park consciousness in the early twentieth century was partly due to the economy, increased leisure time and President Theodore Roosevelt, who was deeply concerned about natural resource conservation. During Roosevelt’s presidency (1901-1909), five new national parks were established and several key pieces of legislation were passed, including the Antiquities Act (1906) which gave the President power to designate places of historic or scientific interest as national monuments. Minnesota was an early leader in preserving important natural and historic landscapes. Itasca State Park in northern Minnesota, for example, became the second oldest state park in the nation when it was created in 1891. Public parks were also established early at the local level. In Little Falls, interest in acquiring the property that later became Pine Grove Park was recorded in the minutes of the January 5, 1893, Little Falls City Council meeting, “Park Committee reported favorable of acquiring Pine Grove for City Park.” This occurred less than two weeks after the park committee was organized and indicates an early recognition by city leaders of a significant natural resource. The desire to preserve the site, which was platted as Pine Grove Addition by Nehemiah P. Clarke, had perhaps been stimulated by the sale of one lot, Lot 10, on January 2, 1893, three days before the City Council meeting. The lot was purchased by Ellick, Sever and Lewis Botton, three brothers who owned a general merchandise store on the west side of Little Falls. The brothers built the home that later became known as the Dewey-Radke House. The house built by the Botton brothers had several different owners throughout its history, including a few who served as caretakers for Pine Grove Park. Thomas H. Dewey, who owned and operated the Dewey Produce Company on the west side of Little Falls, owned the home from 1907 until 1920. The Dewey family kept a watchful eye on the park, putting out wildfires, checking for vandalism and helping to feed and care for the animals. The first animals were a pair of deer purchased in 1913 from a park in Mankato, Minnesota. Money for the deer was raised by subscription. According to the Little Falls Daily Transcript, the Little Falls City Council had to approve the purchase as adding deer would require fencing in a few acres of the park (“Deer for Pine Grove Park”, 6/14/1913). Any money leftover from buying the deer was to go into a fund for acquiring additional animals, preferably an American Eagle and two porcupines. This was the start of what later became Pine Grove Zoo. The first official caretaker for Pine Grove Park was Fred W. Radke. Radke was appointed caretaker and overseer of the park in the spring of 1924, two years after he purchased the former Dewey house from Samuel Hammerbeck. The Radke family owned the house until 1974, when Fred’s wife, Mathilda, died and the property was sold to the City of Little Falls. Radke worked at the park for about twenty-six years, caring for the grounds and for the increasing number of animals. According to a history of Little Falls written by Morrison County Historical Society president, Valentine E. Kasparek, who instigated the purchase of the first deer, by 1939 the “Zoo” had buffalo and elk as well as native deer. Today’s zoo has grown to include a mix of exotic, native and domestic animals, such as bobcats, timber wolves, pronghorn antelope, cougars, bears, prairie dogs and emu. Support for Pine Grove Park has come from a variety of sources. During the New Deal era, federal relief work programs provided funds for a variety of projects, including construction of the rustic log cabin shelter and the stone wall which borders Broadway Avenue West along the south side of the park. Built in 1940 using local labor, the wall compliments the two stone pillars that were erected eight years earlier at the main entrance. According to Bill Henry, superintendent of the Works Progress Administration (WPA) at Pine Grove Park, the stone masons who worked on the site were highly skilled and could cut rock in specific shapes. One example of their skills is the pair of boots that can be found in the base of the log cabin shelter (“Bill Henry reminisces of Pine Grove Park and game warden days”, Morrison County Record, 3/30/1987). The WPA also helped care for and manage the pines. In 1938, Little Falls Alderman Spencer Nelson presented plans to the City Council for using WPA funds to maintain the white pine grove. The plans included clearing underbrush, removing dead trees and fighting pine tree blight (Little Falls Herald, 7/15/1938). 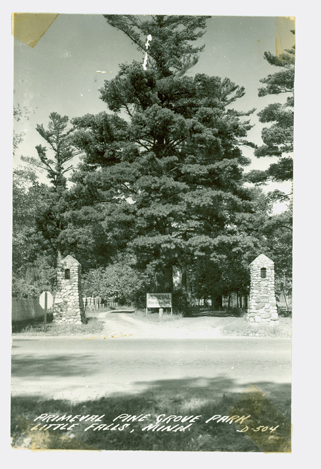 The work done by the WPA was essential in caring for the white pine at Pine Grove Park. White pine can be a difficult tree. Fire-dependent, it needs cleared or disturbed soil for regeneration, is susceptible to insects and disease, and has irregular and infrequent seed production. If regrowth occurs, seedlings are often eaten by white-tailed deer, which love young white pine. Young white pine seedlings are easily overtaken by competing vegetation making control of brush and undergrowth important to their early survival. Seedlings that survive grow only about three feet during the first five years, though growth accelerates fairly rapidly after that. Early lumbermen reported white pine trees that were 250 feet tall with 6 foot diameter trunks (“Little Falls Park Board explores the possibilities of Pine Grove Park’s future”, Morrison County Record, 1/5/1987). At the time it was established, Pine Grove Park was believed to be the only body of white pine within or near any municipality in the state (“City Acquires Park”, Little Falls Herald, 9/6/1907). One of fifty-two trees native to Minnesota, white pine is a softwood tree that entered the area about 7,000 years ago. When European settlers arrived, about two-thirds of the state was covered by forests and white pine dotted the landscape in small groves such as that found at Pine Grove Park. The logging industry found white pine particularly attractive and contributed dramatically to reducing their numbers. Between the 1880s and 1980s, the number of white pine in Minnesota dropped by about seventy-five percent. Clearing for agriculture, roads and urban development has also had a big impact. Today, the decline has leveled off even though the suppression of wildfires, an increased human and deer population, and white pine blister rust, which was introduced to Minnesota in 1916, continues to put pressure on the white pine population. When Frank N. Foster homesteaded 159.84 acres of land in Section 18 of Pike Creek Township in Morrison County, Minnesota, he may have recognized the distinct quality of the white pine grove on his property but he probably had no idea that a good chunk of it would become a public park less than a quarter of a century later. A true community park, purchased largely by local citizens for the purpose of preserving a virgin stand of white pines, Pine Grove Park has served the residents of Little Falls and the surrounding community as a place of inherent beauty for over a century. While changes have been made, including expanding the picnic area, adding playground equipment, increasing the size of the zoo and paving the original automobile routes for use as walking trails, the pines have remained the same. When ­management of the park and zoo was turned over to a private nonprofit organization, Friends of Pine Grove Zoo, on May 2, 2006, it was entrusted with the care and management of an irreplaceable treasure that had been set aside in perpetual trust. The debate stirred by the demolition of a structure on Pine Grove Park property, the Dewey-Radke House, has highlighted a special place of natural and cultural importance, serving as a reminder that critical spaces in our past and present need to be preserved for the benefit and enjoyment of present and future generations. The Morrison County Historical Society would appreciate any photos or information you have on Pine Grove Park and the Dewey-Radke House. Information can include your memories of the sites. Items can be dropped off at the Weyerhaeuser Museum, or you may send an email to contactstaff@morrisoncountyhistory.org. 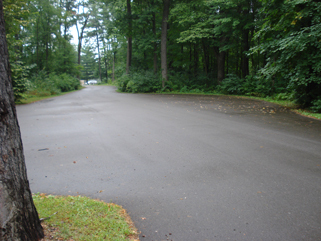 Pavement is taking over at Pine Grove Park, Little Falls, MN, August 31, 2011, photo from MCHS collections.